When Grace Fryer walked on stage in the second act looking sick and deadly, the audience recoiled. In fact, throughout the whole first act, the audience could not help but cringe as the main characters in “Radium Girls” ingested copious amounts of the dangerous chemical, radium. Notre Dame Preparatory High School excellently portrayed this grave topic through their performance of “Radium Girls” on October 27 and two performances on October 28 in the cafetorium. “Radium Girls” is the true story of the female workers in World War I who painted watches with radium, so that they would glow in the dark. Before learning of the dangerous effects of radioactive radium, the young girls spent their workdays licking their brushes in order to keep the tips pointed. However, when many girls became sick and died, the survivors and the families of the deceased, sued the company in order to receive compensation for the medical, financial, and psychological damages. Despite covering a very serious and difficult subject, “Radium Girls” superbly depicted the true story of work, science, and struggle of the early 20th century. 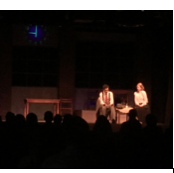 The actors certainly demonstrated their understanding of each person involved in the “Radium Girls” drama, despite the difficulties of connecting with such dynamic characters. The first thing that one might have noticed on the stage of “Radium Girls” was the bright, glowing clock to represent the radium watches. It was a constant reminder of the danger of radium, and it was on display throughout the play. 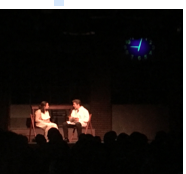 Besides the ominous clock, one may have noticed the brick columns in the back of the stage to represent a factory, and the wooden chairs that the girls sat in to do their work. The stage truly came to life with the lighting effects. At the beginning, a blacklight was used in order to show the glow-in-the-dark paint. However, throughout the play, there was efficient use of spotlight and normal stage lighting. Perhaps the most stunning use of light was when the main character, Grace Fryer, dreams of her time at the factory. A green light shone upon the stage, leaving an eerie feeling of the ill effects from the factory. The audience felt as if they were inside Grace Fryer’s head. Another important aspect of the play was the use of props. The actors used fake blood, legal papers, a wheelchair, an easel, and even a 1920s camera in order to make their production come alive. They also portrayed that they were sick and dying in the second act of the drama, so the actors made use of gruesome makeup. All of these portions of the play combined to create a stellar project. Twenty-eight actors worked together to put on the grave drama, including three teachers, Mr. Marcos, Mr. Mulligan, and Dr. Shuler, who portrayed U.S. Radium Board Members in Act Two. There were also approximately 10 crew members who helped with lighting, props, makeup, and stage-managing. 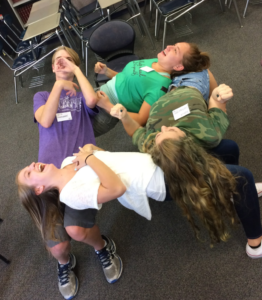 The group became very close after working together for seven weeks and putting in approximately 20 hours each week. All of the actors and audience members could learn something from the tragic story of “Radium Girls.” In the 1920s, few believed these women who were fighting for their rights; yet, now their story can be heard. “It was simple, and it was done well,” Wilson proclaimed. The Radium Girls, still glowing in their graves, might be proud to know that many high school students have learned about their story and struggle for justice.